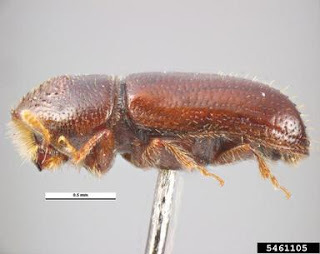 The Pityophthorina are a group of bark beetles including phloeophagous, myelophagous or spermophagous species. Their feeding habits distinguish the Pityophthorina from their close relatives in the Corthylina, though the two groups are less clearly distinct morphologically (Wood 1986). Characters (from Wood 1986): Antennal funicle five-segmented (except three- or four-segmented in Dendroterus, Dacnophthorus and some Pityophthorus costatus), club usually smaller, symmetrical; prosternal intercoxal piece acutely pointed (except obsolete in Dacnophthorus); pubescence usually more abundant, usually in rows on elytra; elytral declivity mostly convex to bisulcate; armature conservative. [CG05] Cognato, A. I., N. E. Gillette, R. C. Bolaños & F. A. H. Sperling. 2005. Mitochondrial phylogeny of pine cone beetles (Scolytinae, Conophthorus) and their affiliation with geographic area and host. Molecular Phylogenetics and Evolution 36: 494-508.